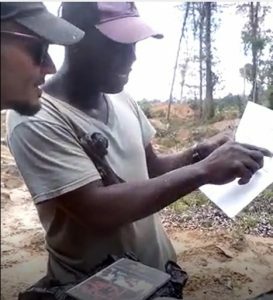 The Ukrainian (left) looking at a document being shown to him by a ranger employed by Shawn Hopkinson’s Mining company. Two Ukrainians have been charged with a number of offences linked to the assault of two Guyanese gold mine workers as well as failure to wear uniforms as private security personnel. Police said the Russian-speaking Ukrainians- 38-year 0ld Vitaly Paraschuck was charged with two counts of threatening behaviour and assault causing actual bodily harm committed on Charles Clarke on July 28, 2018, and 33-year old Maksym Furtak,33 was charged with threatening behavior committed on Rudolph Deane om August 3, 2018. The Ukrainians and Clarke are to be arraigned separately with violating the Private Security Services Act of 2009 for failure to wear their prescribed uniforms. They are all expected to appear on Tuesday before Chief Magistrate, Ann Mc Lennan. The incidents occurred at Quartz Stone on a mining concession owned Guyanese miner Shawn Hopkinson. His concession is located nearby another that is the subject of a legal dispute involving CBR Mining and West Demerara Mining Inc.
One of the victims was assaulted and a gun pulled on him after he had told the Ukrainians that based on documents in his possession and GPS readings they were on Hopkinson’s concession.